How can foreign fighters transform existing radical Islamist networks? 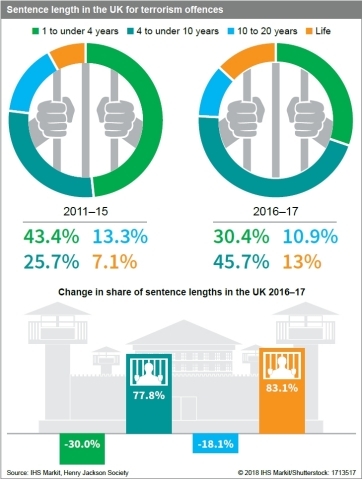 Sentence length in the UK for terrorism offences. LONDON--(BUSINESS WIRE)--Terrorism risks in Europe are likely to increase in 2018 as foreign fighters depart the former ‘Caliphate’ in Iraq and Syria and bring their training and expertise back to the continent, according to a new report released today from Jane's Terrorism and Insurgency Centre (JTIC) by business information provider IHS Markit (Nasdaq: INFO). “In the five- to 10-year outlook, European countries will face an elevated terrorism threat posed by radicalized convicts, returned foreign fighters and other returnees who have direct ties to the legacy of the Islamic State,” said Otso Iho, senior analyst at JTIC by IHS Markit. Growing numbers of Islamist convicts are likely to exacerbate the risk of radicalization in prisons. Additionally, many of those imprisoned for providing support to groups like the Islamic State in the past two years will probably be released between 2019 and 2023, according to data analyzed by JTIC. Islamist militancy will remain the primary terrorism threat in Europe, with international operations becoming increasingly important for the Islamic State as it seeks to maintain its relevance among supporters globally. 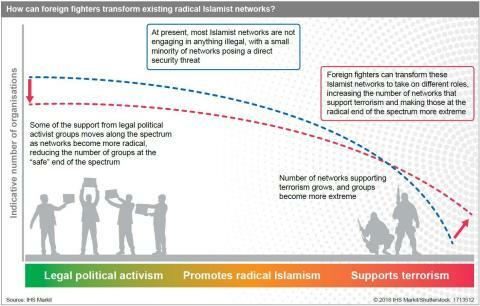 Returning foreign fighters will drive an increase in the terrorism threat, particularly via the potential transformation of radical Islamist support networks into operational structures directly involved with attack plots. Though low-capability methods will remain prominent, it is likely that new and more destructive methods will emerge in the next two years in Europe, including the use of car bombs and the adoption of new technologies such as drones. JTIC’s analysis of European prison sentencing reveals that between 2019 and 2023, a substantial number of terrorism convicts who have been active supporters of Islamist militant groups are likely to be released into the general population. Security services will struggle to adequately monitor a combination of returning militants, an increased number of radical Islamist networks involved in the propagation of terrorism, and the radicalization risks associated with a substantially increasing Islamist prison population. In addition to the immediate and direct security threat posed by returning foreign fighters, a significant risk is likely to emerge through their potential to transform and radicalize existing Europe-based Islamist networks. ‘Low-capability’ attacks, including crude improvised explosive device (IED) attacks, vehicle-impact attacks using rented or stolen trucks and vans, knife and (in a limited number of cases) small-arms attacks are likely to continue, employed primarily by individuals or small cells. The successful use of car bombs or suicide attack car bombs by Islamist militants on European soil would mark a notable increase in the threat level. There are indicators that some cells have already attempted to adopt this method, including the perpetrators of the August 2017 attack in Barcelona, Spain. Returned militants will increase the likelihood of the successful execution of such an attack, due to relevant skills learned within the Islamic State’s ‘Caliphate’. JTIC’s analysis of European prison sentencing reveals that between 2019 and 2023, a substantial number of terrorism convicts who have been active supporters of Islamist militant groups but in most cases have not taken action to plot or conduct attacks in-country, will be released from prison. As foreign fighters return and militant Islamist activity continues, this trend is likely to accelerate. Since the 2015 attacks in Paris, counter-terrorism legislation across Europe has been harmonized substantially, and on a legislative level most countries are equipped to deal with returnees in a ‘hard’ manner i.e. imprison those who have committed terrorism offences or pose a clear security risk. In practice, however, enforcement of these laws varies somewhat from country to country based on their experience of terrorism: countries such as the Nordics, which have had lower terrorism exposure, tend to have more lenient sentencing. “Though it is too early to make definitive conclusions based on available data of returned foreign fighters, harsh sentencing practices in host countries do not necessarily appear to be a significant disincentive for foreign fighters returning from Iraq and Syria,” Iho said. Jane’s Terrorism and Insurgency Centre (JTIC) by IHS Markit uses open source data to build its global database of both attacks by non-state armed groups, in addition to counter-terrorism operations and key statements by state and non-state actors. The database enables users to search by location, target, group (active and dormant), tactics and casualty numbers in order to quickly obtain actionable intelligence and/or data. The database includes over 250,000 events since 2009 and tracks over 1,000 separate non-state armed groups worldwide. Get in touch here to learn more about JTIC and other solutions from Jane’s.